Okay, so I know it's only Tuesday but I must admit that it feels like a Friday since we have a short work week this week! I LOVE that we have a short week this week, that my family starts to arrive tomorrow, and that I get a long weekend to spend time with family, eat lots of yummy food (I know, I know... Carolyn...make sure to at least try and eat in moderation because we all know you will regret it come Monday and it's time to hit the gym again....) and of course, work on my Christmas shopping. 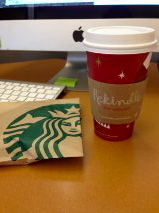 I took a stroll to the local Starbucks today on my lunch break and it just put me in the perfect holiday mood! I love when the holidays cups come out in coffee shops, it just makes me feel all smiley and happy no matter what kind of day I am having before I step into the shop. I ordered my regular drink when I go there, a Grande (sometimes I still call it "medium" but try to remember the correct term when I actually order) Skinny Carmel Macchiato (heavenly!) and because I had a light lunch before I went on this coffee run, I allowed myself to get a piece of pumpkin bread that I have been eyeing for weeks! Let me tell you, it was absolutely delicious -- and totally worth the extra time I will make myself run on the treadmill for tonight! As the holiday season continues you will probably get more posts from me that reflect upon all things holiday. I absolutely LOVE this time of year -- I love the music, the decorations, the shopping, the movies, the food, etc. It just puts me into a great mood whenever I start seeing Thanksgiving and Christmas decorations because they represent a time of the year when people always seem to at least be happy (except when it comes to shopping, which seems to make people grumpy for some reason, but more on that in a later post). What are you favorite parts of this time of the year? Or what are your least favorite parts? It's always interesting to see different people's experiences and views about the holiday season. I'd love to hear what you have to say! P.S. Here's my outfit inspiration for Thanksgiving dinner (I found the picture on Pinterest and am going to try my bet to replicate) . What do you all think? What's the "dress" like at your Thanksgiving dinners? You lucky gal! I wish I could do that but everyone that is a part of my Thanksgiving is always dressed up so I woud definitely be the odd one out! So now I try to wear something nice-looking while also being as comfortable as possible...hence the leggings :) Hope you have a great Thanksgiving! !